Join Barbie (TM) in an all-new world of Butterfly Fairies! 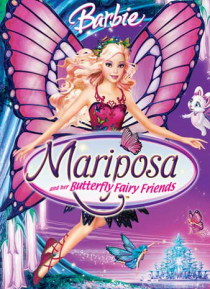 Mariposa is a beautiful butterfly fairy who loves to read and dream about the world outside her home in the land of Flutterfield. Flutterfield is protected by the Queen's glimmering magical flower lights, but when the Queen is poisoned by the evil fairy Henna, the special lights begin to go out one by one. It's up to the brave Mariposa and… her friends to journey beyond the safe borders of the city in search of a hidden antidote that will save the Queen. Join the butterfly fairy friends on an exciting adventure that will transform them forever!